3D printing is a massive asset when it comes to the medical industry, especially regarding the reproduction of body parts. Indeed, it allows the creation of custom-made 3D printed prosthetics that can perfectly fit the patient’s morphology. Doctor Olivier Pagès is one of our customers. This French surgeon worked on a great project: a 3D printed rib cage. We had a chat with him to learn more about this project. First, can you introduce yourself to our readers? I’m a thoracic surgeon and cancer specialist. I work in the Clinique des Cèdres, a major private hospital in Toulouse, France. Can you also introduce the people who helped you with your 3D printing project? I asked for the help of multiple sources. First, some medical teams from other fields who already work a lot with 3D printing, like Dr. Jean Périssé, stomatologist in Toulouse, or Dr. Clément Ernoult, a maxillofacial surgeon in Dijon. I also worked with engineers from the CIRIMAT of the Toulouse university, such as David Grossin, specialized in biomaterials. Toulouse’s Fablab also helped me a lot with its 3D printing technologies training. Last but not least, YouTube was a great help thanks to its numerous tutorials. You created a 3D printed rib cage. Can you tell us more? Why did you decide to work on this project? 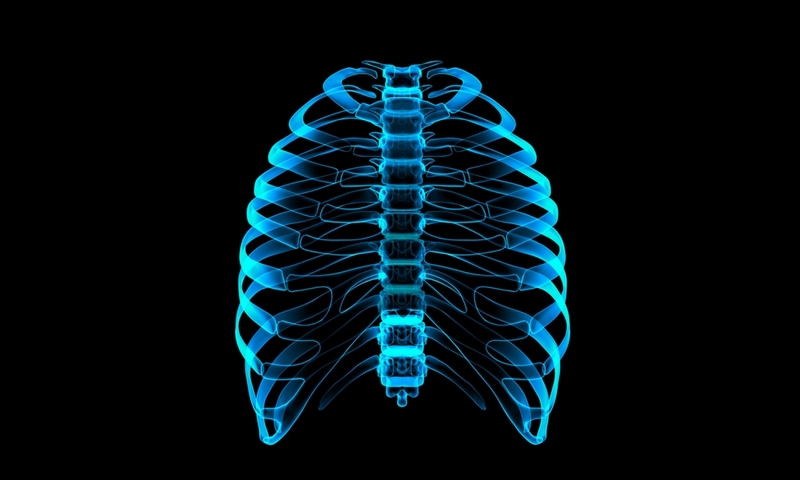 In my field, we have to deal with some chest wall diseases which require a reconstruction of the bone structure (sternum, ribs) which can be important. The techniques of surgical replacement of the chest wall which are currently used are not satisfying. They’re not custom-made. Most of the time, they’re in titanium. They don’t respect the patient’s stereotaxy and as a result, they also don’t respect the mechanical constraints linked to respiratory cycles. So these prostheses often break on almost half of the patients. Thus, a new intervention is needed from 6 months to 1 year after the first one. That’s how I came up with the idea of a custom-made prosthesis, which is made possible thanks to 3D printing. Why was 3D printing the best technology for this custom-made prosthetics project? The democratization of 3D printing encouraged me. You can start with the first steps of your project to make sure of its feasibility, without taking too many risks or without making important money investments. For instance, the digital part of the project was built thanks to software you can download for free on the internet. What was your experience in 3D printing before working with our service? Which skills did you have to develop? Before this project, I had absolutely no experience in 3D printing. I developed my 3D modeling skills in a 2-hours training from the Fablab of Toulouse, twice, and then by watching tutorials on the internet. The 3D printing phase in itself didn’t interest me much at this step of the project, that’s why I decided to trust Sculpteo! How did you get your 3D files? The idea was to create a very easy process, without complicating the patient’s treatment. So the original data comes from the thoracic scan of the patient, made without contrasting product injection. It is realized in a totally standard way, and it can be made in any radiology service. Which software did you use for this 3D printing project? I used OsiriX to deal with the DI-COM files I got from the scanner, then I modified them with Blender and Meshmixer. These 3 software allow the creation of a proper stl file before sending it to the 3D printer. How did the collaboration with our online 3D printing service go? Very well. Your 3D printing service is fast and efficient. The online simulation tools are precious when it comes to choosing the right material for instance. Which tips would you give to someone who is just getting started with 3D printing? Keep trying, with 3D printing, there’s always a way to solve your issues! You can look for it in tutorials or other resources, but maybe it will be up to you to find it! Which opportunities does 3D printing bring to the medical field? The interest of 3D printing for the human body is already proved, everyone is now convinced of that. The pioneers have been the teams working on the mandible or on the calvaria. They elaborated techniques that allow the replacement of defecting bones as in a real 3D puzzle. We hope you enjoyed this testimonial! Interested in 3D printing for the medical industry? Read our blogpost about how 3D printing impacts the medical industry or this one about the best 3D modeling software for the medical industry.